Open 21 is a double exposure/blackjack variant where a tie is a push, a player blackjack automatically pays 3-2, and a player 21 is an automatic winner. To pay for all these good rules, a side bet is mandated at half the Open 21 wager. The game had its debut on March 3, 2017 at both Grosvenor Casinos (Bolton and Aberdeen) in the U.K. 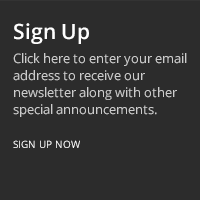 Unless otherwise stated, ordinary blackjack rules are followed. Play starts with the player making an Open 21 wager and an Odds Win wager. The Odds Win wager must be at least half the Open 21 wager. In addition to the two required wagers, there is also an optional Perfect 11 side bet, based on the player's initial two cards. The pay table is shown below. As in blackjack, both the player and dealer shall start with two cards each. However, as in double exposure, all initial cards are dealt face up, including both dealer cards. If the player's initial two cards form a blackjack, it shall immediately pay 3-2 odds. A dealer ace and 10-point card shall count as 21 points, not a blackjack. If the player draws or doubles to 21 points, it shall be an immediate winner and pay 1-1. All other wins pay 1-1. If player's initial two cards are an even total, then the Odds Win wager shall lose. If player's initial two cards were an odd total, and the player wins the hand, then the Odds Win wager shall pay 2 to 1. If player's initial two cards were an odd total, and the player ties the hand, then the Odds Win wager shall push. If player's initial two cards were an odd total, and the player loses the hand, then the Odds Win wager shall lose. After the initial two cards are dealt to each player, the dealer will remove any Odds Win bets from players with an even number of points. The player may double or split, as in conventional blackjack. If the player doubles an odd total, he does not double the Odds Win wager. If the player splits, he must have an even total, thus the question of splitting the Odds Win wager is moot, because it would have already lost. Following is the pay table for the Perfect 11 side bet. All pays are on a "to one" basis. The player should bet the required half the Open 21 wager on the Odds Win wager and no more. Following are four strategy tables according to whether the dealer hits or stands on soft 17 and whether the player's original total was even or odd. However, the four strategies are the same in the vast majority of cases. For all but the most perfectionist players, I think it would suffice to learn just one strategy. In the U.K., I would go with the one for stand on soft 17 and an odd total. In the U.S., I would go with the one for hit on soft 17 and an odd total. 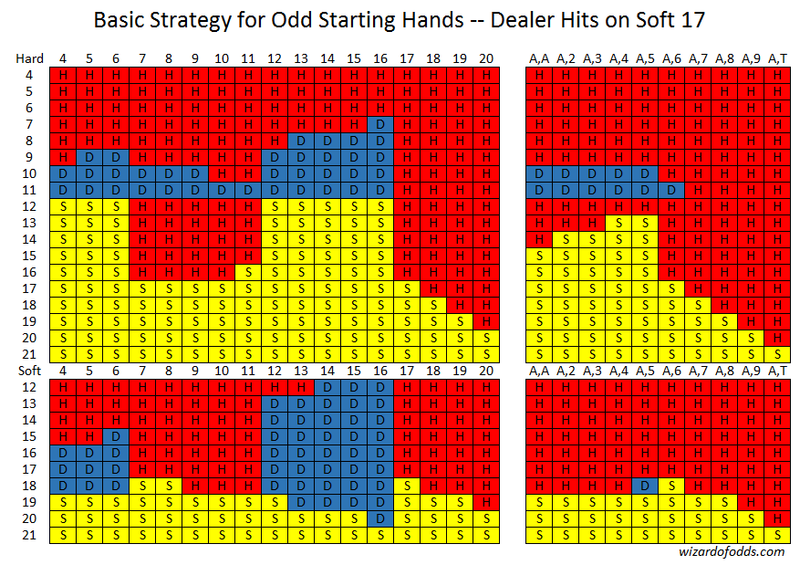 The following basic strategy is for odd-numbered starting hands, where the Odds Win bet is still in play, and the dealer hits on soft 17. A key follows the final basic strategy table. 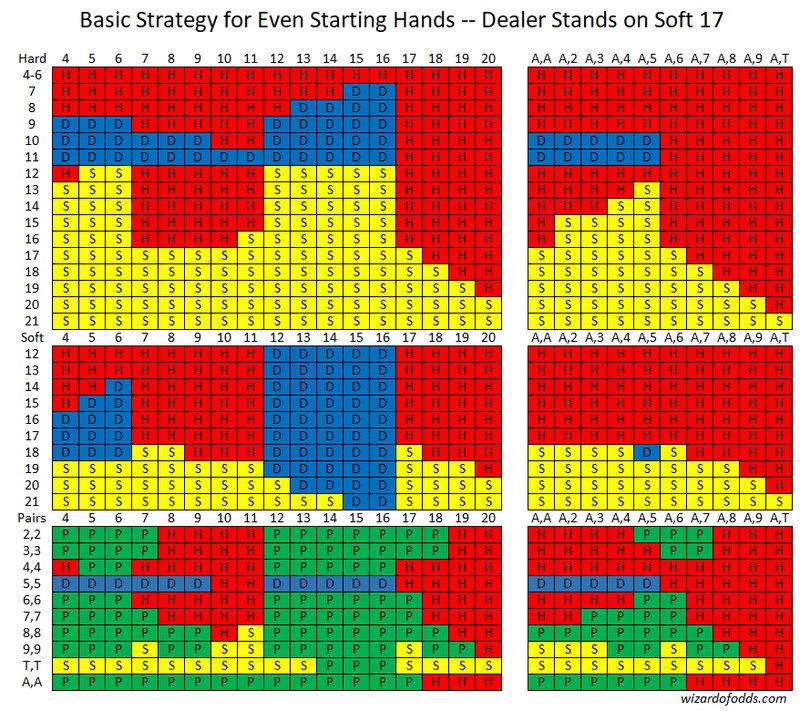 The basic strategy is for even-numbered starting hands, where the Odds Win bet is not in play, and the dealer hits on soft 17, is at the top of the page. We are having some technical issues and will move it back down here as soon as we're able. 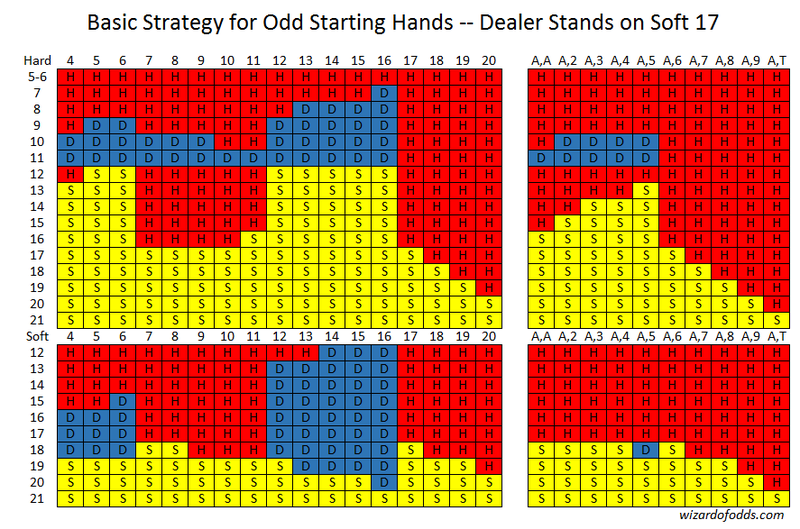 The following basic strategy is for odd-numbered starting hands, where the Odds Win bet is still in play, and the dealer stands on soft 17. A key follows the final basic strategy table. The following basic strategy is for even-numbered starting hands, where the Odds Win bet is not in play, and the dealer stands on soft 17. According to the mathematical analysis of the game owner, the house edge is 0.51% if the dealer stands on a soft 17 and 0.96% if he hits. The following table shows the probability and contribution to the return for all possible outcomes of the Perfect 11 bet, based on six decks. The lower right cell shows a house edge of 6.21%. Discussion of Open 21 in forum at Wizard of Vegas.